Region 9 (Zamboanga Peninsula) - Barely 10 months from the release of a P200T DOLE-9 livelihood grant, parents of children-miners and children at-risk of becoming child laborers (CLs) from four impact areas surrounding the gold-rich Sitio Balabag in the municipality of Bayog, Zamboanga del Sur finally got their first taste of success during the Ceremonial Transfer of NGP Funds on July 24, 2013 in the barangays of Depore, Dipili, Pulangbato and Dimalinao, Bayog. The organization of parents came right after the conceptualization of Project Tambayayong in June 2012, a holistic approach towards the elimination of child miners from mining activities and their reintegration to mainstream education. 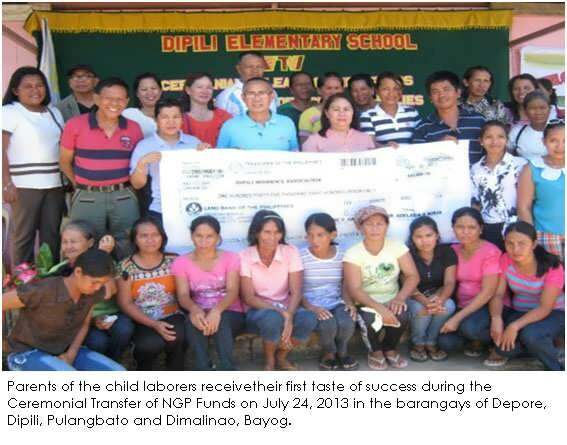 With the strong partnership among stakeholders ranging from government agencies and the PagadianCity-ZDS Chamber of Commerce and Industry, the project paved the way for the investigation of child labor cases in small scale mining operations, and the provision of livelihood assistance to their parents. Strongly anchored on the Campaign for Child Labor-Free Barangays with the aim of creating a common understanding, influence change and identify the roles and solicit commitments of stakeholders, particularly government agencies, non-government organizations, private sector, local chief executives, and the parents of child laborers, Project Tambayayong identified TVI Resource Development (TVIRD) Philippines, Incorporated, a mining company operating in the area, to serve as DOLE's Accredited Co-Partner, which eventually organized the parents into 5 People's Organizations (POs). 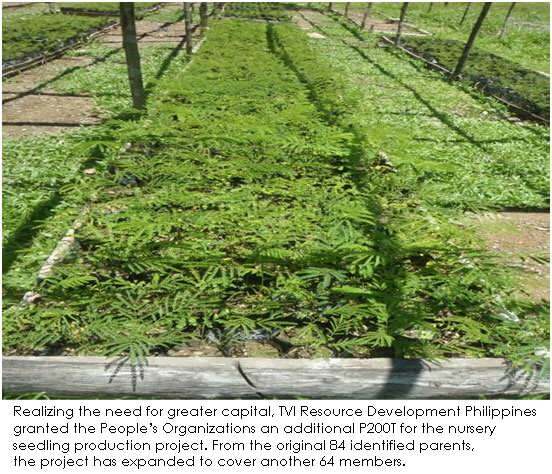 Realizing the need for greater capital, TVIRD also granted the POs an additional P200T for the nursery seedling production project. From the original 84 identified parents, the project has expanded to cover another 64 members. Wasting no time, the POs under the close supervision of TVIRD's Community Relations and Development Office ventured into their first rubber seedlings production. Because of its effect on the National Greening Program (NGP) of the government, the livelihood project has been cited by the Department of Environment and Natural Resources. Thus in April 2013, the POs entered into an agreement with the agency to supply the seedlings needed for the implementation of the NGP in the province. The ceremonial transfer of funds amounting to P 748,440.00 by the Zamboanga del Sur Provincial Environment and Natural Resources Office (ZDS-PENRO) covers only 60% of the more than P1.5M agreed value for the 150,000 rubber seedlings, with the additional payments expected to take place within the next few months as deliveries conclude. TVIRD's distribution of educational packages to more than 800 students from the 4 barangay schools added spark to the already victorious events. In his speech, Ret. Col. Valentine Idang, officer-in-charge of the Balabag Project stressed TVIRD's corporate social responsibility in ensuring the well-being of constituents under their areas of operations, stressing further their commitment for security, especially that of children. DOLE-9 Regional Director, Sisinio B. Cano stressed the importance of convergence in bringing about development in communities. He said that DOLE's provision of livelihood assistance, aptly backed up by TVIRD, and the involvement of the LGU and DENR in providing the market for the products yielded positive results. He assured the public that DOLE is just a text away, and that the Office is always ready to lend assistance. The DENR, represented by Dr. AdelaidaBorja, head of the ZDS-PENRO emphasized about the NGP and the need for all, children and adult alike in the preservation of the environment, particularly on the planting of 10 seedlings annually from 2010 until 2016. The LGU, as recipient of the convergence program conveyed its appreciation for all involved agencies, highlighting the positive influence of the DOLE-DENR-TVIRD partnership to the people and their contribution to the total well-being of the municipality. Because of the project's impact in the program, Bayog has been nominated as a model municipality for the "Plant and Nourish a Tree" project in the region. In local dialect, the executive assistant of Mayor Leonardo Babasa, Jr., Mr. Virgilio Zamora said that Bayog is now flooded, not with rainwater but with progress and optimism for the future.